Between a tangle of briars, a path leads past the marble lion statues to an ornate palace hidden deep in the grounds. The Kathgola Bagan Bari, an 18th century palace, is owned by a Jain businessman’s family, the Dugars. They had the living quarters renovated by a French architect in the late 19th century and added the Victorian lions and Michelangelo statues. This was one of the sights—of palaces and garden houses—that drew me to Murshidabad on a weekend trip from Kolkata. Murshidabad gets its name from Murshid Quli Khan, Aurangzeb’s governor. Only 40km away is Plassey, where Robert Clive, commander-in-chief of the British Indian Army, defeated Siraj-ud-Daulah, the last nawab of Bengal. One way to explore the city is to strike a deal with a tongawala or a cycle-rickshaw driver so you can explore the city over two days at leisure. South of the Kathgola Bagan Bari lies the majestic Hazarduari Palace, overlooking the waters of the Lal Dighi (red pool). It was nawab Nazim Humayun Jah who built this palace with nearly 1,000 doors in the 19th century. It has a 96-branch silver chandelier sent by Queen Victoria to nawab Nazim Humayun Jah as a present; a silver dressing table used by Siraj-ud-Daulah’s mother, and a Burma jade dinner set that changes colour at the touch of poison. Nearby is the horseshoe Pearl Lake, or Moti Jheel, framed picturesquely by the ruins of Ghasiti Begum’s garden house. She was the daughter of the 18th century nawab Alivardi Khan. It is rumoured that a wealth of pearls still awaits the lucky diver. Close by, the imposing gateway, Namakharamer Deori, still guards the way to the dilapidated palace of Mir Jafar Ali Khan Bahadur, the first nawab of Bengal; he was a supporter of the British. There is the garden house of Jagat Seth (a moneylender during the reign of Siraj-ud-Daulah). In a short stroll through these, the complex events of treason that saw Mir Jafar, Siraj-ud-Daulah, Clive and Seth playing a role, start to unfold. If you’re a history enthusiast, this is one area you wouldn’t want to miss. Too many stories to be woven into two days. It sounds like a theme for the silk weavers of the region—Murshidabad is where Bengal’s famous Baluchari saris are still woven in the narrow lanes of Khagra Bazaar. Stop for “melt in the mouth" khaja, crunchy sugar-dipped puff-pastry wafers that can be bought at roadside tea stalls and washed down with tea. A weekend just allows you to sample the city. It would probably take months to get under its skin. 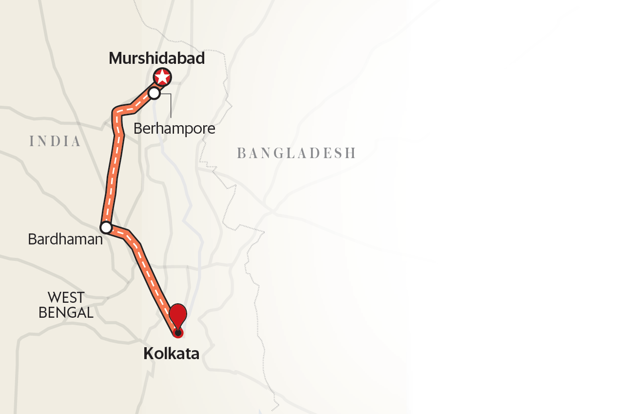 Route: Exit through Barrackpore Trunk Road to get to Bardhaman via National Highway 19. Turn right towards Behrampore. Murshidabad is 11km from there. Stay: Roopkatha Guest House; (www.thesugarrandspiceroopkatha.com); tariff for double occupancy starting from Rs2,600. Top tip: Catch the Heritage Festival in December to sample Sheherwali cuisine.